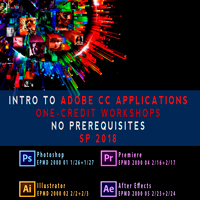 One-credit workshops are being offered in several Adobe CC applications. The latest phase of Webster University's partnership with Adobe grants access to Adobe Creative Cloud and 20GB of cloud storage for every student, faculty member and employee across all of Webster’s U.S. and international campuses as well as its online platforms. Students will be able to use Adobe CC to create persuasive and compelling digital content, develop new critical thinking skills and share work with fellow students through these cutting-edge educational tools. Assigning students projects such as creating electronic portfolios, infographics, websites, podcasts, videos and more because no matter the area of study, every student needs to be a digital storyteller. Encouraging students to think creatively and open their minds to creative expression so they can turn their classroom ideas into college and career opportunities. Giving students access to every Adobe CC application that will enable them to create digitally compelling work utilizing video, audio, imagery and more on all of their desktop, labs and mobile devices. This spring the School of Communications is again offering a series of weekend, one-credit seminars that introduce students to several Adobe applications. See Adobe resources for Webster community members here. Webster has also instituted a faculty user group to ensure Adobe CC is being integrated across campus. A new student user group is also expected to start later this year that will provide resources and help students gain access to the software. These user groups will ensure that world-class design tools like Photoshop, InDesign and Illustrator are integrated into classroom activities. Students in the School of Communications previously received access to these tools as part of the initial phase of the partnership announced in 2016. See the full announcement in Adobe's newsroom here.